Entering a new era, Kandypen’s new Prism Plus has a drastic change in its new design. It has been awarded the ‘Best Overall Vape pen of 2017’ by the Vapeguide. The new design provides a sophisticated look that has a great feel to it. As it embarks in the new direction, it takes on the world with a bolder design. The new addition to Kandypen’s family of infamous vape pens carries the milestone innovations previously achieved. There are no new innovations in the prism plus. The compact design does bring us a great product that gives us a worthwhile experience. The prism plus brings us a new design which is made of stainless steel along with a metallic black plate that gives us a great elegant look and feel. The casually fashionable pen doesn’t keep any smudges or fingerprints amazing enough. The original prism is small in size, only about 4″ tall and half an inch in width, which makes it easy to hold, its weight is comparable and is neither too heavy nor too light. It gets it just right that makes it feel good while using it. The stealth-like compact design of these models has increased the conceal-ability compared to most of the other vape pens available. The prism plus is merely 1mm taller and about half an inch thicker than its first version, prism. Along with the change in the curvature design that Kandypens usually have. The strong and simple design does not carry the symbolic ‘k’, instead, you can find the vaporizer’s own prism logo on the lower side. The only lights on the pen are small for ones on the side which slightly thwarts its discreteness while another light on the power ring around the power button which can be easily hidden by placing our thumb over it. The option to choose between two atomizers is available for the vast users. The ceramic lined chambers are accompanied with a completely ceramic plated heating chamber. The latter is also ceramic-lined but with a dual quartz coil placed inside. Both of the coils are leak-proof making it easier for the people to use more oils with the wax. There is a new essential oil vaporizer that has better quality and finish. The variety of options available makes it easier for the individual to avoid looking around for 2 different pens for an exemplary session. They would no longer have to chase other pens because it can be easily found in a single pen at a reasonable price comparatively. The wax pen elevates the great aspects of a Kandypen Mini. The prism plus has 900mAh an increase from the prism’s 320mAh. The elevated battery power doesn’t improve performance but simply increases the strength and lifetime of the battery. It is useful in other aspects as it would be strong enough to handle a good long session. It goes without saying that the Kandypen is accompanied by their idealistic lifetime warranty. The battery contains the 4 settings feature, it changes its colors as the voltage of the battery being used increases, starting from the lowest, we have yellow, green, red and lastly blue. The battery can be charged using the micro-USB slot at the side, it is a good feature but I was admittedly a tad disappointed. 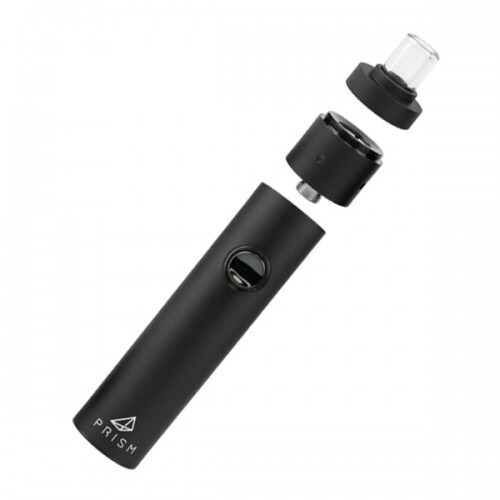 The prism has 2 ports which include a micro-USB port and a lightning port for the convenience of iPhone users, those with a prism pen can enjoy vaping as it simultaneously charges. The glass mouthpiece is a good addition, they are usually the most preferable ones. They don’t break as easily as the other plastic or rubber mouthpieces do. The taste is definitely better when they use a glass tube. 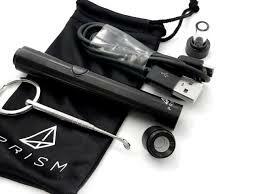 Ultimately, the prism pen carries a glass mouthpiece which can cool down the heat can provides us with a clearer airflow. Do note, that the prism plus has comparatively larger air holes which makes inhaling much smoother. The mouthpiece also holds a splash guard which protects it from any hot sputters. This is a helpful feature in terms of the temperature at the top of the pen which becomes too hot to use. The heating chamber is very easy to access, the user simply has to unscrew the top, where the mouthpiece is located. They can add about 0.1-0.2g of dabs and enjoy the limited experience smoothly and with above than average experience. An important thing to note is that the Prism plus does carry one very concerning flaw. The top part of the vape pen gets hot as the heat chamber is there and frequently with the other Kandypens we have never faced this problem. Usually, those vape pens were built with different material, they were either plastic or something else other than metallic. Another reason that might be causing this problem is the expanded heat chamber which is causing the upper part of the model to heat up so much. The compactness makes it easy to conceal, which is a major leading point for the prism plus. The vape pen’s minuscule shape that’s about a mere 4 inches tall can be easily carried around in your shirt pockets or its small bag even. The prism plus is slightly fatter but doesn’t affect the easy to carry use of it. The discreteness is a massive improvement over the previous Kandypens models. This is largely due to the exclusion of the symbolic ‘k’ that lit up and the removal of the lights at the bottom of the battery. However the 4 lights can pose some concern, the pen can be easily held in your palms covering it from all sides. Therefore, making public smoking more convenient and easy. The interface of this pen is very easy to understand, it is pretty straight forward. There is a single button, which activates the pen after pressing it 5 times. The lights on the pen’s center and side begin to illuminate as it opens. The temperature of the pen can be adjusted by pressing on the button three times. It simply follows the pattern of its predecessors while improving on some other aspects. Upon the removal of the mouthpiece at the top, there is the atomizer which can be switched out for the other one based on the user’s preference. There is a port for charging on the side. Prism can stand on its own presenting a simple but strong look. The 2 different coils are a good feature that deserves praise. Something we were introduced to in the previous model, Kandypens Gravity. This pen seems to carry the tradition with a slight innovative twist in the making of the coils. The completely ceramic plated atomizer gives a blast of the taste and a clear vapor feel. 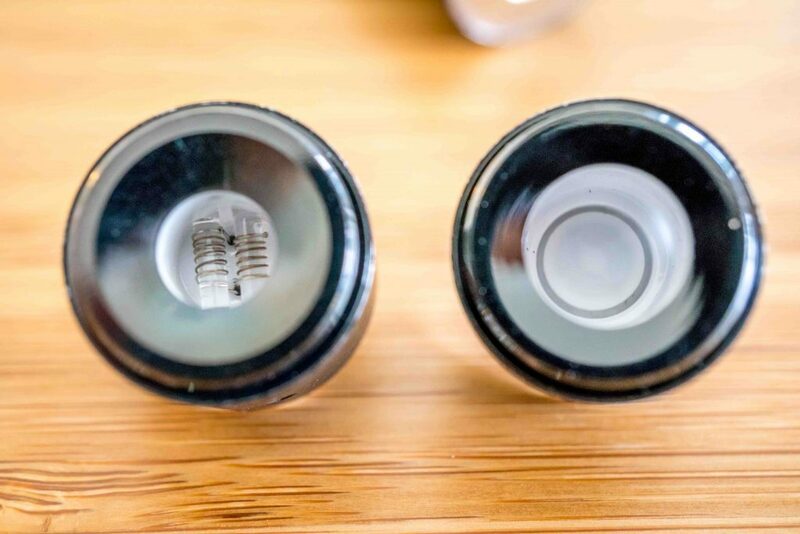 On the other hand, the dual quartz coil gives off the high vapors and strong taste with a slight lack of that pureness we get in the ceramic plated atomizer. It should be known that bigger dabs will ruin the carb of your wax, and the taste will also go downhill because of the high intensity of the heat. The traditional 4 battery settings are something that is very handy. Usually, at the blue light, the highest setting can provide you with a very satisfying hit, the Prism Plus couldn’t reach that standard. Do not mistake its capabilities to produce a good vapor and strong hit. The compact design does pack a fruitful punch. The prism plus is better than most vapes out there, but it doesn’t reach the quality you expect from a Kandypens. We have found the coils to be the reason behind the bad experience. 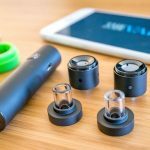 Even though the Prism Plus comes with a kit to easily clean out or maintain the vape pen to help the user in such cases. Some of the wax still gets stuck at the ring on the bottom of the atomizer. The Kandypen also comes with a handy key chain and a protective pouch. The battery of a Kandypens has never failed us in the past, Prism Plus sustains that reputation. It has surprisingly provided us with a more than adequate vape pen. That has all the functions and the efficient working. Kandypens prism plus is yet another great addition to the variously successful vape pens they have launched in the past. This new vape pen brings a brand new design that sets it apart from its previous models. The unique exterior doesn’t affect the quality of the interior. Prism plus upholds the standards and provides us with a high-quality vape pen expected of Kandypens. It can be held at the highest regards similar to the past models. Though this Kandypens model doesn’t bring us much for new exciting features to play with. It surely enhances the experience by restructuring the product and can be applauded for the intriguing approach. The vape pen is easy, the design is simple and sleek. The performance of the vape pen is overwhelming. Choosing between the available options has earned nothing but praise, it gives the users the ability to elevate the experience that they are trying to have. The battery in prism plus does help make it last for a longer amount of time. It always feels good to know that there is a lifetime warranty for the battery. The compactness of the device is a huge improvement that makes this vape pen more desirable. The vape pen does pertain a heating problem on the top side which can force others to be a little reluctant in trying to purchase it or use it. The heating problems must be fixed in order to perfect the already famous vape pen. It has to fix this in the next version of the product regardless of the things that are affecting its ability to reach the peak that it potentially can. The cost of the pen is too high, the quality may be just but charging a bit more than its counter-part (Prism) is a straight out typical marketing technique. The only features in the prism plus comparatively aren’t that significant to charge customers a higher rate. They can easily have most of the things through the first Prism. In conclusion, Kandypens continues to impress with the quality and design of its products. Prism plus is no stranger to the idealistic standards of the exquisite brand. The cost may hinder a potential number of people but it doesn’t hold back on its ability to perform. There is very little to none of the things that holds back this product as it continuously exceeds the expectations. The unavailability of a lightning port is only a drawback for all those iPhone users. It would have been ideal to have that port to make it more feasible for everyone to use. Kandypen’s Prism Plus is made for the avid user, they can feel the elevation of the new vape pen. It aims to reach new heights in this industry. 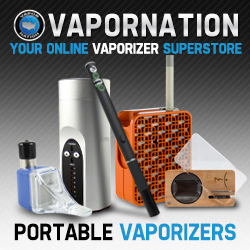 Check out all the Kandypens Vaporizers.